Researchers are working towards developing a new and improved carbon fibre material – one that environmentalists can get on board with. In a world where technology is constantly changing and innovation is all around us, it is important that these changes have a positive outcome. With a growing concern for the well-being of the natural environment, a higher number of industries are seeking new technologies to reduce their environmental footprint. Carbon fibre is used for many applications, including automotive and aerospace components, military technologies, and other civil projects. It is very useful because of its strength, durability, chemical resistance, temperature tolerance, and low weight, but traditional carbon fibre manufacturing is not environmentally friendly. Traditional carbon fibre is made through a lengthy process, starting with a synthetic precursor called poly-acrylic-nitrile, or PAN. It is then processed using industrial ovens and furnaces that lead to the release of greenhouse gases including nitrous oxide and carbon dioxide gases. Other harmful compounds are also released such as ammonia and hydrogen cyanide, both of which are toxic to humans if inhaled at a high enough concentration. While PAN carbon fibre contains this chemical precursor, researchers have developed a carbon fibre that starts off with a compound found directly in nature. This new and improved carbon fibre uses an alternative precursor known as lignin. Lignin is a naturally occurring compound that makes up the cell walls of plants, and is stiff and rigid enough to be used instead of PAN. It serves as an excellent choice for a precursor to use in carbon fibre because it is readily available, high in carbon, low in cost, and is a renewable resource. Lignin can be found in almost any plant material found on land, and is the second most common natural polymer found on Earth (the first being cellulose). 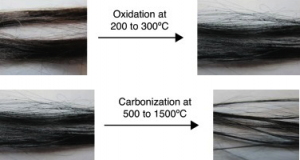 The processes involved in producing both traditional and lignin-based carbon fibre are fairly similar when it comes to the overall method. This means that companies do not have to develop and purchase an entirely new production system should they want to switch from PAN to the lignin precursor. The differences lie within the development of the precursor. Carbon fibre made with a lignin precursor. Note that the appearance is much the same as traditional carbon fibre, though the polymer structure may not be identical. Photos are Figures 19 and 21 in Mainka et al 2015, under a Creative Commons license. PAN is synthesized by mixing plastics together, a main one being acrylonitrile. Acrylonitrile is not produced in Canada, and has been declared toxic and harmful to human health under the Canadian Environmental Protection Act, 1999. Acrylonitrile is carcinogenic, and if there is a large, highly concentrated spill, it may be toxic to the environment as well. The exact method companies use today to make traditional carbon fibre is a trade secret, but we know they must synthesize organic compounds which requires a large amount of energy. This leads to high costs and energy concerns for the company. Needless to say, the PAN precursor is not an ideal option. While PAN must be synthesized through various steps, lignin is naturally occurring. Lignin is readily available for industrial processes as it is a byproduct of paper and pulp production, and so does not need to have its own special extraction process. This lignin byproduct starts off as a powder at the pulp or paper mill. The powder at this point is heated to remove any moisture or volatile compounds with the help of a vacuum to remove any of these gases, leading to the formation of lignin pellets. From there, the lignin fibres are created by a process called “spinning,” where the lignin is wound at a fast rate using a spinneret to get the desired fibres, which are then oxidized, stabilized, and carbonized. Research into using lignin for carbon fibre has been progressing successfully over the years. Initially, the development and production stages varied from today’s production, particularly as chemical reactions were used to to modify the chemical makeup of the lignin. At the time, this was the only way to create a lignin precursor that could lead to viable carbon fibre. Now, thanks to the utilization of a thermal extrusion process, certain productions allow the chemical makeup of the lignin to be similar to what is present within the plants themselves. This advancement in research and technology has greatly reduced the cost of the precursor when compared to PAN. The lack of chemical synthesis required to form the precursor also leads to a significant reduction of carbon dioxide emissions into the atmosphere. While there is still more research being conducted to fine-tune the use of lignin as a precursor for carbon fibre, it is headed in a very promising direction, with some companies already demonstrating its abilities in multiple projects. Currently, this version of carbon fibre is deemed useful for general purposes, but high-performance applications like aerospace or military components still require traditional PAN carbon fibre. Lignin is best suited for less precise uses, such as the manufacture of bicycle frames, or lower volume applications. Research in the application of lignin-based carbon fibre is ongoing around the world and in Canada. In a world faced with climate change, it is extremely important to create products in a smarter way. Using this plant based precursor for carbon fibre is a step in the right direction to create an innovative material while still being environmentally-friendly. Chemistry, Guest Authors, New Science Communicators anita campanelli, carbon fibre, chemical engineering, green chemistry, lignin, materials science. permalink.